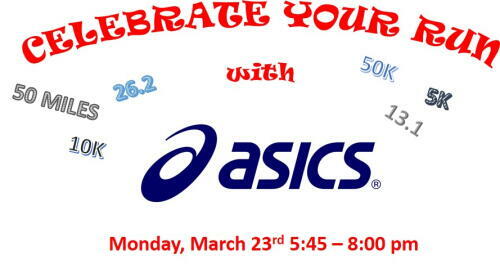 Home › Events › CELEBRATE YOUR RUN!!! Whether you run Quintiles Wrightsville Beach Marahon, Half Marathon or 5K or another race, or just run for fun, we want to celebrate your accomplishments! 6:00 PM - a fun run or recovery run (depending on what you need) where you can test run the new ASICS Nimbus, their high cushioned GEL shoe. Since we always want to support and celebrate our community as well, 10% of all sales during the event are going to support and celebrate Wilmington's own Felicia Wilkerson's 12 for 12 for 1200 Foundation, benefiting the MARSOC and SemperFi Fund. Learn ways you can support her efforts during the event.